My internship at OK Divers was slowly coming towards the end and just a thought of me returning back home made me feel anxious. Honestly, after a year in Bali, I could not imagine what am I going to do in Slovakia. 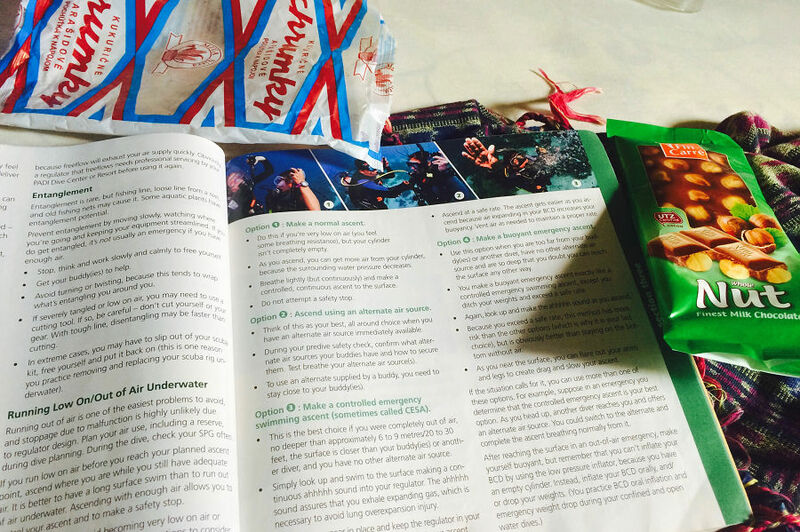 You may remember how difficult it was for me to learn how to dive (if not, you can read more about my Open Water Diver course in 2nd, 3rd and 4th part of my blog from Bali – trust me, after reading this your self-confidence grow much bigger/it’s a light reading for an instant ego boost. I was hopeless (my nick name was DD as Diving Disaster). I thought that scuba diving is not for me, because my hobby to panic might be stronger than my urge to see that amazing underwater world. 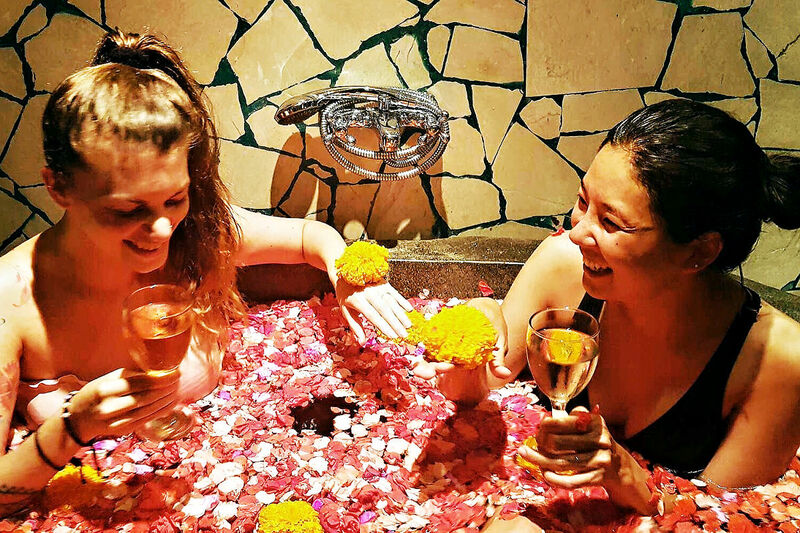 Read more about Lila’s Bali Diary Part 9 – Why to dive in Bali (especially in Padangbai)? I have never been a big fan of massages, wellness or spa treatments. On the other hand, my mom is a different story. She loves massages as much as I love food. I have always tried to be a good daughter. So for a Christmas gift I booked a treatment for her in one of the most recommended Thai massage centers in Bratislava a few years ago. Unfortunately, she got sick and it wasn’t possible to change the date of the appointment. Instead of losing the money for the expensive prepaid treatment, I forced myself to have a spa day. My experience was not the worst I’d had, but it didn’t cause me to fall in love with massages either. People who know me well (but also those who don’t know me so well) know that my ,,relationship” with food is really special. In my case it’s just 100% true, that the way to my heart is through my stomach. I feel instant happiness when eating food. Or, to be exact, when eating GOOD food. My obsession with food is well known. A rather interesting story has begun to spread that if someone wants to get me on a date, they simply need to invite me for a good meal, because that is the one thing I can’t resist. Well, I don’t know who came up with this theory, but let me tell you, they are right. Manta point, Nusa Penida. 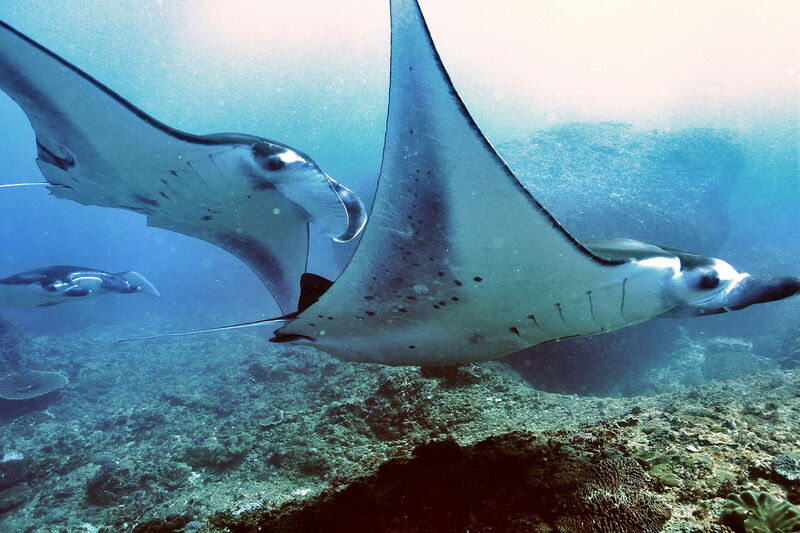 During the 3 months that have passed since my arrival in Bali, I have heard from our diving guests at least a million of absolutely amazing experiences from this dive site. 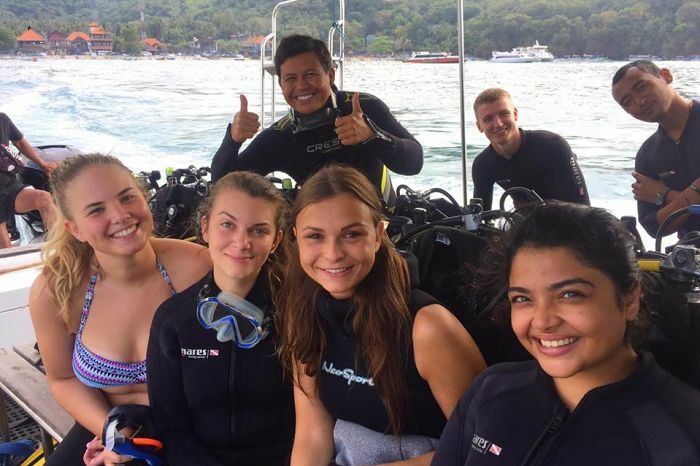 To be honest, sometimes it was pretty hard for me to listen to their stories (you see, it’s not always easy to smile at guests when you envy them so much and would immediately swap sweating on a chair in a dive center for a nice trip to Nusa Penida and, as a bonus, enjoy a dive with giant manta rays). 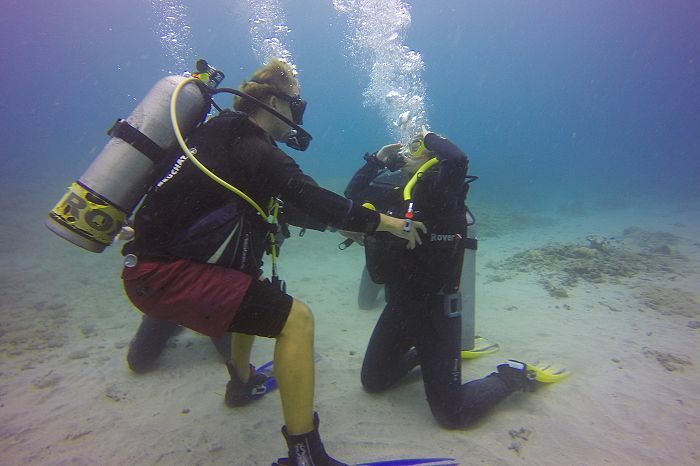 My joy of scuba diving lasts until Laci tells us that the next day we are going to practice a second round of practical exercises in the sea, including mask, compass and self-rescue exercises. I slept awfully. I was constantly waking up and when I was up, I tried to breathe only through the mouth, without using the nose. When I came to the pool at OK Divers in the morning, I felt terrible, but I was determined not to give up. "Laci, I'm taking a snorkel and a mask, and I will try to do the impossible here in shallow water." "Yeah, I'm just gonna prepare the bottles and I'll be right there." 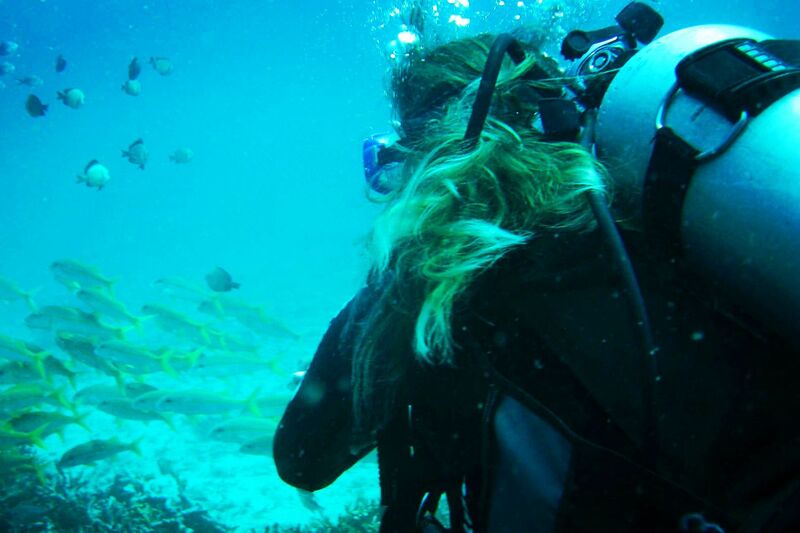 I try to calm down and immerse my face in the cool water, without a mask, just with a snorkel. Until I have only my face in the water, I don’t use my nose. But once I dip the whole head, I can instantly feel the salty water in my throat. When the instructors at OK Divers told me that I would handle the PADI Open Water Diver course with no problems, even though I had never dived before, I was kinda skeptical. 28 years have been enough time for me to realize that I am often quite hysterical. Actually, I was panicking about potentially starting to panic underwater. At the same time, however, I was ready to do what it took to become a diver. I've always been an adventurer. It usually occurred to me that I had the sudden need to escape my promisingly developing professional life. Because of this need, for example, I decided to travel to Rwanda after college, with an original plan to save the world. Later, I changed a convenient job at a law office for a non-profit job, which among other things, ensured the exchange of used syringes for drug users.